A stir-crazy urban athlete’s guide to indoor sports in Seattle. If the cold, wet weather and shorter days are putting a damper on your outdoor workout, head inside and try something new. Here are a few cool ways to feel the burn—without catching a chill. Perhaps it’s no surprise that the world’s first indoor climbing gym opened its doors in rainy Seattle back in 1987. These days, industry pioneer Vertical World (daily rate $16, monthly membership $70; five locations, including Magnolia, 2123 W Elmore St.; verticalworld.com) operates five different indoor climbing gyms around the Puget Sound area, including a new state-of-the-art facility just down the block from its original, more humble digs in Ballard. Another great place to while away a rainy day with chalk on your hands and heights on your mind is Stone Gardens (daily rate $16, monthly membership $70; locations in Bellevue and in Ballard at 2839 NW Market St.; stonegardens.com). And don’t forget that the Pinnacle at the REI flagship store ($7 per climb for members, $20 for non-members, advance reservations recommended; South Lake Union, 222 Yale Ave. N; rei.com/stores/seattle/climbclass.html) is 63 feet of rock, available for veteran climbers in need of a quick fix, as well as for beginners (and kids) looking to literally learn the ropes. Also, Huskies have exclusive access to the Crags Climbing Center ($3.25/day with current University of Washington ID; Intramural Activities Building, 3924 Montlake Blvd. NE; depts.washington.edu/ima/IMA_icc.php), which features more than 5,000 square feet of rock climbing walls up to 42 feet high. Be one with the winter chill by taking to the ice for your workout. While Seattle may not be known as an ice skating mecca, there are several rinks around town that offer not only daily public skating sessions, but also lessons in how to figure skate and even play hockey. Highland Ice Arena (18005 Aurora Ave. N; 206.546.2431; highlandice.com) in Shoreline may be the best-known rink in the area—almost everyone who grew up in Seattle has logged at least a few laps there—but also up north is Mountlake Terrace’s Olympicview Arena (22202 70th Ave. W; 425.672.9012; olympicviewarena.com) and the Lynnwood Ice Center (19803 68th Ave. W; 425.640.9999; lynnwoodicecenter.com). On the Eastside, check out Kirkland’s Kingsgate Ice Arena (14328-A 124th Ave. NE; 425.821.7133, ext. 104; kingsgateskatingclub.org), and if you’re down south, Renton’s Castle Ice (12620 164th Ave. SE; 425.254.8750; castleice.com) can’t be beat. Looking for a chill workout—minus the skates? Try your hand at curling, a sport that gained popularity in Seattle during the Vancouver Olympics. 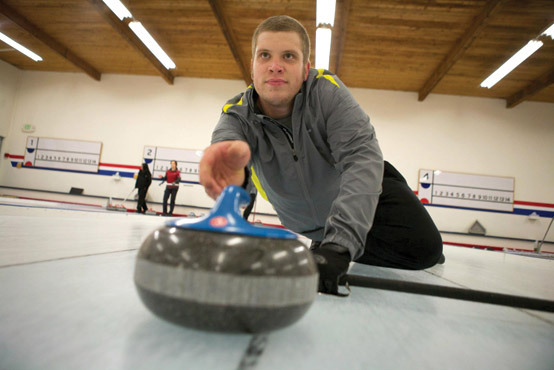 In curling, players slide 42-pound granite stones across a sheet of ice toward a target. Teammates “sweep” along in front of the stone, using special brooms to warm up the ice for better sliding. Give it a try at North Seattle’s Granite Curling Club (Haller Lake, 1440 N 128th St.; 206.362.2446; curlingseattle.org), the only facility of its kind on the West Coast. In operation since 1961, Granite has produced more national champions than any other curling club in the U.S., but it’s also a perfect place for beginners to get started. Check out one of the open house events, usually held the second Saturday of each month. And then there is parkour, an extreme sport developed in the suburbs of Paris a quarter-century ago and now practiced in urban areas the world over. According to Parkour Visions (parkourvisions.org), a nonprofit dedicated to spreading the parkour gospel across the Pacific Northwest, the sport involves overcoming obstacles as swiftly and efficiently as possible using only one’s body. Participants (“traceurs”) climb on and leap and flip between buildings, pillars, poles, walls and banisters—essentially whatever is in the way. Beyond the thrill of artfully and energetically moving through and around obstacles, parkour can also be a serious fitness-training workout and confidence builder. Parkour Visions recently opened the region’s first indoor gym devoted entirely to parkour on Queen Anne (1210 W Nickerson St.; 206.923.8864), where the group leads regular weekly classes for beginners focusing on movements, proper landing techniques and safety. Once you’ve learned the basics, you can join or form your own club through Seattle Parkour (seattleparkour.com), Washington Parkour (washingtonparkour.com) or Parkour Visions. Can’t make it to Hawaii this month? Stick your toes in the sand at an indoor beach volleyball game. Sandbox Sports (sandboxsports.net/indoor-leagues) runs leagues and drop-in events throughout the winter at its Georgetown facility. Also, Arena Sports (arenasports.net/indoor-beach-volleyball) now offers indoor beach volleyball leagues at its buff new Magnuson Park facility, not to mention indoor soccer and an impressive new gym with weight rooms, exercise machines and a basketball court.